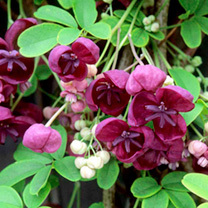 With bright green leaves composed of five obovate leaflets notched at the tips and fragrant reddish-purple flowers, Akebia quinata is a climber that sometimes has purple fruits which are up to 10cm in length. Flowers April-May. Height 301cm+. Supplied in a 2 litre pot.